With HRT's announcement today that they have brought Narain Karthikeyan in for another shot at a full time race seat, the 2012 F1 entry list is finally complete. All 24 seats are occupied, and the feat has been achieved more than a month before than the start of the season. In 2011, HRT left the announcement of Tonio Liuzzi until the 9th March! This time round, they've at least got their act together, even if their driver lineup is still questionable. Here's the full list of each and every driver starting the 2012 season. There's not an enormous amount of change at the top, whilst there have been quite a few seat swaps towards the rear of the grid. There are just two rookies this year, with Pic and Vergne having the biggest hill to climb as 2012 gets underway. Although, in reality, the spotlight really falls on Kimi Räikkönen, who takes his turn to make a big comeback. 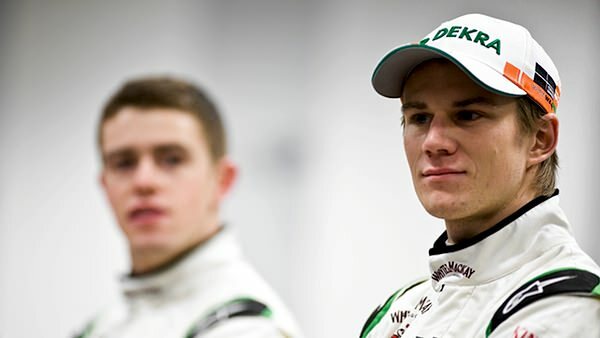 I'm really looking forward to seeing what Hülkenberg can do, and seeing the partnership with him and Di Resta will be intriguing. Force India's new regime of bringing a driver through a year of testing before stepping up surely puts pressure on them both, but Hülk has it all to prove. The trouble with the teams at the top is they mostly revolve around one star driver with the other one hanging around in the background. McLaren buck that trend, and I can't wait to see if Button can keep pushing forward, and if Hamilton can come back fighting. Their inter-team battle could be one of the best. All eyes on Räikkönen, of course, and it will be interesting to see by what margin he dominates the Lotus team. Can Romain push his own personality through where Kimi's unique style gets all the attention? I've loved Heikki at Lotus Racing/Team Lotus/Caterham so far, and can't wait to see if they can push through to the points. Trulli I am less fond of, but they obviously see something in him so we'll have to see how he does. The overriding image of Pedro de la Rosa is one of the long term tester, and that instantly conjures up thoughts of slow and out of touch driving. I wonder if that isn't simply because of Badoer, who may have done the world of test drivers a disservice. Pedro has driven more recently than that, and did a respectable emergency job filling in for Pérez in Canada last year. Karthikeyan isn't much of a benchmark though, and vice versa. The battle for 21st place is guaranteed to be a scorcher. Tracking the driver stories throughout the year is one of my favourite parts of following Formula One, and the intricacies of drivers wanting desperately to win but also having to play the team game make them fascinating, rollercoasters of emotion from start to finish. Here's to 2012, let's hope it delivers!